Western nations want to chain “the Russian bear,” pull out its teeth and ultimately have it stuffed, Russian President Vladimir Putin warned. He said anti-Russian sanctions are the cost of being an independent nation. Putin used the vivid metaphor of a “chained bear” during his annual Q&A session with the media in Moscow in response to a question about whether he believed that the troubles of the Russian economy were payback for the reunification with Crimea. “It’s not payback for Crimea. It’s the cost of our natural desire to preserve Russia as a nation, a civilization and a state,”Putin said. The president said that even if “the Russian bear” started “sitting tight… and eating berries and honey,” this would not stop pressure being applied against the country. “They won’t leave us alone. They will always seek to chain us. And once we are chain, they’ll rip out our teeth and claws. 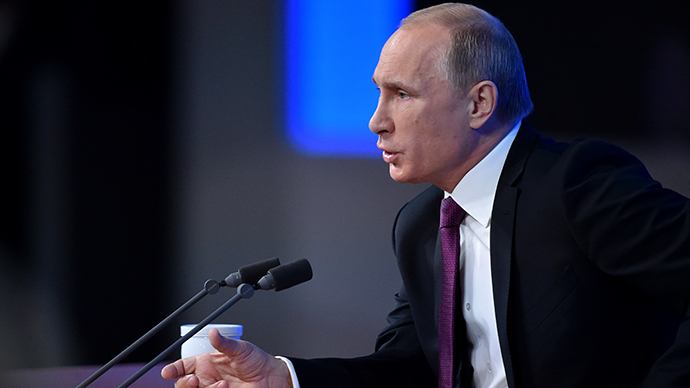 Our nuclear deterrence, speaking in present-day terms,” Putin said. “As soon as this [chaining the bear] happens, nobody will need it anymore. They’ll stuff it. And start to put their hands on his Taiga [Siberian forest belt] after it. We’ve heard statements from Western officials that Russia’s owning Siberia was not fair,” he exclaimed. The West had an anti-Russian stance long before the current crisis started, Putin said. The evidence is there, he said, ranging from“direct support of terrorism in the North Caucasus,”to the expansion of NATO and the creation of its anti-ballistic missile system in Eastern Europe, and the way the western media covered the Olympic Games in Sochi, Putin said.